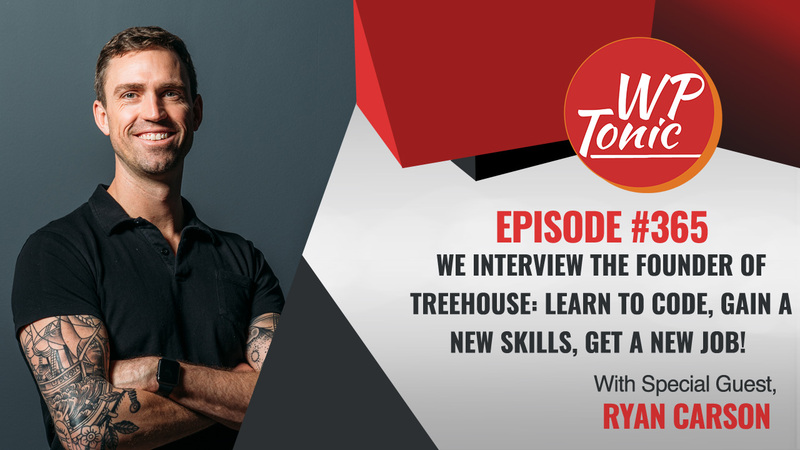 We interview one of my online eLearning entrepreneur heroes Ryan Carson #RyanCarson founder and CEO #TreeHouse TreeHouse. is one leading technical online training providers. Ryan is a real cool cat who recently been saying some very controversial things connected to higher education and how the present situation is failing students. If you thinking of starting a online business based training you really need to. listen to this interview. Jonathon: Welcome back to the WP Tonic show. This is episode 365. I noticed a little bit of a cliché with me, but we really did have a special guest with us. Somebody that I’ve been following for many a year. That’s Ryan Carson from Treehouse. Ryan, would you like to quickly introduce yourself to the listeners and viewers? Ryan: I’d love to, and thank you for your very generous introduction. My name is Ryan Carson. Born and raised in Colorado Springs, Colorado in America. Studied computer science in college because I was lucky to figure out that was a good thing to study. And then I moved to England, because I wanted an adventure. And I was going to stay for a year, then met a girl, stay for 12 years. So that’s the whole story. And ended up starting Treehouse, which is an online school. we teach people how to code. We also now help businesses build and hire diverse balanced engineering teams. Because as we all know, diversity and balances a very rare thing in tech these days. So that’s us. Jonathon: And I got my great cohost here Cindy Nicholson. You like to introduce yourself quickly, Cindy? Cindy: Sure. Hi everyone. Cindy Andy Nicholson from the course whisper.com. So I help people that want to create their online courses. Jonathon: And I’m the founder of WP Tonic. We help you with learning management systems, membership sites. Built on WordPress, which operates 30 percent of the Internet. So that should be good. But before we go into the interview, I want to quickly mention one of our major sponsors, that’s Kinsta hosting. Kinsta hosting only specialize in WordPress hosting. They are big enough to have all the bells and whistles, but small enough to still care. They host the WP Tonic website. They’d been a major sponsor of the show for over two years. They’re great people. You get 24 hour specialized tech support. They really know their business. They use Google cloud as their backbone of their server network. So it’s top notch server technology that’s utilized to host your website. You get all the bells and whistles staging site. The latest version of PHP. I can’t praise them high enough. If that’s interesting. Go to kinsta.com and do yourself or your clients a favor and sign up. Ryan, so Treehouse. What made you get into the crazy world of online training? Ryan: Like I said studied computer science, four year degree here in the states. And then got a job and actually my first job was in Cambridge, England. I asked a recruiter to get me a job and he found this web design company and out in the countryside in Cambridge. And I remember showing up and the interview started and they said, have you ever written Cold Fusion? And I said, I don’t know what that is. And they said, well it’s a programming language. And I said, well, I know c++ so I can figure it out. And they said, you’re hired. And I just like blown away by that whole experience. Wait a minute, I just spent four years of my life. My parents just dropped 50 to 60 grand and you’d like, none of it mattered. What was my computer science degree for? And so I think that’s where it all began. Something’s really wrong with the higher education system and it doesn’t lead to a job. I want to be a part of changing that. And that eventually is where Treehouse came from. Jonathon: So that`s the seed of it. Did you go out and get finance for your company or did you bootstrap it? If it was [04:27] inaudible What was the [04:29] inaudible about online education? I want to build this platform. Ryan: Yeah, it was interesting as I was in England. Ended up marrying a wonderful British woman and started Treehouse there in Bath, England. So literally the opposite end of the world of Silicon Valley. And what’s interesting is I had created an events company where we did in person events. They were conferences and workshops to teach people how to code. And they were all in person. And we realized this was not going to scale. We basically, we’re helping people that already. They didn’t need help. They already had enough money to go to these expensive conferences. And how do we take this and scale it and actually help more people? So my wife said, well online, like let’s just create courses online and we will copy Lynda.com pricing and charge 25 bucks a month. And I thought genius, let’s do that. So how we funded it is we used cash flow from the, in person events business to bootstrap it. And it was minimal. I mean we hired two contractors. We shot, we use the HD video camera with a white sheet in the background. we did it as cheap as we could. And in fact we ended up getting a bank loan. So I literally went to, I think it was NatWest. Ryan: Well, and this is so like old school now. But the reality is I went to get a small business loan and there’s nothing wrong with that. I want one. Jonathon: Did they give it to you? Jonathon: You must have owed four houses and have a balance sheet to prove that you did need the money in the first place. If they lent you any money. growth of the business and it was small. I mean, it wasn’t some crazy number and I said we’re growing. We’re very mildly cash flow positive and I think this is worth you lending us. I think it was like 50 grand and they did it. And so I just want people listening to hear like, you don’t have to go raise money from BBC. You don’t have to be written about in Tech Crunch. If you believe in what you’re doing and you’re growing it responsibly and you’re solving a real problem, ignore all that stuff. Jonathon: Oh, that’s great. Cindy? Cindy: Thank you for sharing that. That’s kind of cool that your wife way back then kind of have the vision to go online. Like that’s just so impressive. Cindy: You met a good one did yah? So can you kind of take us, you talk about your beginnings of getting started with the business. Can you kind of talk about the evolution of how it’s grown to where it is today? Like how did you go about making the decisions you made? Like what kind of changes have you made over time to get where you are today? Ryan: You Bet. So you heard the starting story of the business. The way we did our first marketing push was we actually told our event attendees about it. So we kind of sponsor our own conference. And so the message there was we spend a lot of years building a community and then we launched the product into it. So it was the classic overnight success that took seven years to build. So we did that and we saw people sign up on day one, which is encouraging. And actually we got to be kind of ramen profitable where we were just covering our costs with a small team. And it was pretty quickly and I would say maybe two months. but it was literally just me, Nick and Jim, our first two teachers and a part time programmer. Then it kept growing and we started generating a small profit. And I showed the revenue growth spreadsheet to a friend of mine who happened to be an angel investor and he said, I want to invest in that. Ryan: And I just didn’t know what to do. I thought, I don’t know how that works. I need to go read a book. So read a book literally about how investing works. And at that moment I decided I think I want to raise money because I believe in our mission and if we’re a bigger company, we grow faster, I can help more people. So we decided to say yes to him and he said, I will tell my friends or rich people, to invest with me. And I’ll help you put together your seed round. And I didn’t know what to think about all this. I never encountered any of it, but I ended up saying yes. and that was when we raised our first, I think it was like $600 to $700,000 seed round back in 2011. And since then it’s been a very interesting up and down journey. so it’s been good, hard fun, everything. Jonathon: That’s great. So I think one of the things you and your team are really in the kind of learning education industry are well known for is, your promotion and the concept that Game of Thrones citation. What led you and your team to look at that concept to rejuvenate your training in the outcomes that you were getting? Ryan: I think we just felt that learning should be more fun. and we started off very simply. If you can earn points while you’re learning that we kind of cool. And so we, it was very simple. you would watch a video and if you got to the end of it, you had earned points. And that was really. And then we realized, oh, badges would be kind of cool. and so we made it. So when you completed a course, you’ve got a badge. And we got feedback from our students that this is kind of cool and they craved getting the badges. so then we added one thing more, which is a code challenge where you actually had to code a challenge correctly. The computer kind of grades and then if you pass it then you continue on the course. So we just kept adding more and more elements of reward for good learning behaviors. Ryan: But it evolves. What we actually learned was that doesn’t always work. It’s fun, but you may not actually be learning. And so what we did is we ended up, putting in projects that were required. And we built a whole new product called Tech Degree. And Tech Degree is basically an online boot camp that’s, it’s about six months long, takes two hours a day. And you have to build a real project. And it actually feels like riding a bike and it feels like the training wheels get ripped off. Because you think, I know how to do this. And then all of a sudden you’re facing a blank page and you think, I don’t know how to do any of it. And that’s where the synopsis is actually getting formed in your brain because you’re taking the content and reforming and something new. And that was a big learning leap for us. And then you get graded on that project and people really, really, really want exceeds expectation, don’t want just meets expectation. So we use that as well. So gamification is really been an ongoing thing for us and it’s changed the company. But we’re still learning how to help people learn. Jonathon: That’s great. We’re going to go for a break folks. When we get back, we will be talking some more with a bit of a hero of mine, Ryan Carson. We be back in a few moments folks. Announcer: Do you want to spend more time making money online? Then use WP Tonic as your trusted WordPress developer partner. They will keep your WordPress website secure and up-to-date so you can concentrate on the things that make you money. Examples of WP Tonic client services are, landing pages, page layouts, widgets, updates and modifications. WP Tonic as well known and trusted in the WordPress community. They stand behind their work with full. No questions asked. Thirty day money back guarantee. So don’t delay. Sign up with WP Tonic today. That wp-tonic.com. Just like the podcast. Jonathon: We’re coming back. Cindy that is a good interview. It`s just being me and you most the time. But I’ll be chuffed. Ryan came on board for the interview. So Ryan, what are some of the things that you’ve learned through the education online education process around effective education? A slight question, Ryan. Ryan: Well that’s like my life for the last eight years. To sum it up in a sense, I guess. I’ve learned a big personal lesson which is you’re access, to be able to learn is affected by a lot of things that are outside of your control. For instance, what if you grew up with parents that have a computer in your home or if you see people like you coding. These are all advantages that you have. And so I grew up seeing white men like me, Steve Jobs building big companies, creating wealth, building technology companies. And so it’s easy for me to picture myself doing that. And so I ended up learning how to code in high school. And what I didn’t realize until recently how, privileged I was to be blunt. Ryan: And so what we’re learning is that if we truly want to, empower millions of people, we have to take into account the fact that not everybody starts at the same starting line. And gender comes into this sexual preference comes to this. There’s a lot of stuff that really matters here. So we built a new program called Talent Path that’s specifically aimed to bring more equity into tech. And it’s been a really, really eye opening learning experience but a good one. And so now we’re helping companies build apprenticeships that are built on top of our curriculum. And it’s just been amazing. It really has been life changing. Cindy: That’s really cool. And I love your perspective from the fact that just because you are sharing information doesn’t necessarily mean that the person is automatically going to learn it. Especially when they have all these filters that they’re learning at. By you looking at it from this perspective, I think you’ll have much better opportunity to reach the people who want it. But I’m more, I’m interested in hearing more about this Talent Path. Like how do you go about, you know, making things more equitable? Ryan: So what happened is I started Treehouse because I thought making education affordable and accessible would somehow change the system. And yes to an extent but not true change. And so eight years later we’ve taught 850,000 people how to code. I’m proud of that. But you can look around you and the system has not changed. Tech is still white, still male. It’s still, nothing seems to have truly changed. So why? So I signed this thing called a diversity pledge here in Portland and it was a government initiative. I view myself as a moral person who believes in these things, so I signed it. And then I just had a moment of clarity. I looked at Treehouse itself, my own employees, and we had 80 employees at that point and I realized, you know, what, I’ve hired mostly white men. Ryan: So if I believe this, then how did I do that? Like, what’s wrong? So I went through a pretty deep learning journey, and just figure it out. Oh, I started like three laps ahead of a lot of people because I was a white gendered male. Like I didn’t know that. So then how do we change it? Like I can’t change society. So we just took a simple step. We basically went to the boys and girls clubs, which is a local nonprofit which serves communities that are primarily black and brown. And we said, we want to invest in you, we believe in you and we want to hire you as apprentices. And are you willing to try that with us? And they said yes. So we basically said we believe in, you want in, this is not charity, we would like to use our own curriculum as the backbone and then we’ll layer on top mentorship and support for soft skills. And then at the end that we guarantee you there is a job for you and we’ll hire you as a software apprentice. Ryan: And it changed my life like literally. And this is just for us, we weren’t trying to create a product or anything. And then, as soon as we finished this experience, it took a year, I think we realized, oh my goodness, this can be plugged into any company in of the world as long as there’s a boys and girls clubs. locally where we can source talent from. And so that became one of our biggest products. Now it’s called Talent Path and it’s being installed across America. Big companies like Nike and Hubspot and Airbnb and it’s really, really exciting. Cindy: Wow, that’s fantastic. It’s awesome. It’s amazing to hear about how the journey of how you ended up finding that and that it is what you want to do. Jonathan? Jonathon: That’s great. We are going to end the podcast part of the show. Ryan’s been very busy today, but he’s agreed to stay on for a little while. We’re going to be talking about some broader subjects about what you see in the future of higher education in North America. And I’ve got some other questions. Ryan, how can people find out more about you and what your company’s up to? Ryan: Thankfully I’m really googleable. So if you just Google Ryan Carson, I guarantee you’ll find me. Thankfully if you go to Treehouse, you’ll find me. So Google Ryan Carson Treehouse or Tree House Talent Path. You’ll find everything you want to know. Jonathon: That’s great Ryan. Cindy, how can people find out more about you and what you’re up to? Cindy: Oh, well, they can come visit me at my website at the coursewhisperer.com or also reach out to me on LinkedIn. Jonathon: That’s great folks, and if you really wanted to support the show, please give us a review on iTunes. I’ve been having some interesting discussions with iTunes lately. Their support. They’re very polite, but getting somewhere and sticking my head on the table. But we will see you next week we’re going to have somebody like Ryan, a great guest. And somebody sharing his great experiences. We will see you next week folks. Bye.